Dublin (AFP) - Leo Varadkar promised a "republic of opportunity" Wednesday after he became Ireland's youngest prime minister and the first who is openly gay. 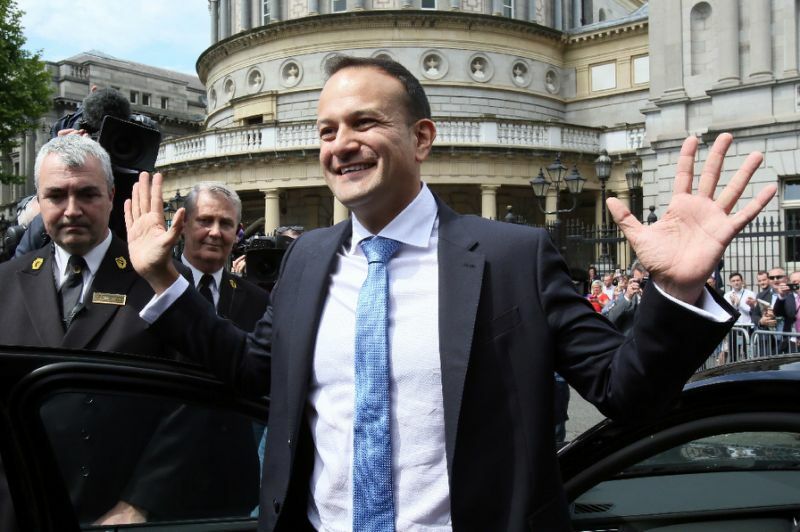 The Dublin-born politician's Indian immigrant father and Irish mother were in parliament to watch as the 38-year-old was formally confirmed as taoiseach. Varadkar, who won the leadership of the ruling centre-right Fine Gael party earlier this month, was confirmed by 57 votes to 50, with 47 abstentions. In his acceptance speech, Varadkar emphasised youthful energy, arguing that the politics of the past were no longer fit for purpose. "The government that I lead will not be one of left or right because those old divisions do not comprehend the political challenges of today," he said. Varadkar takes over a minority government from Enda Kenny, who said his successor reflected a changed Ireland. "As our youngest taoiseach, he represents a modern, diverse and inclusive Ireland and speaks for them like no other," Kenny said. He added Varadkar would meet "head on" the challenge of Brexit, an issue of particular concern to Ireland as it shares the only EU land border with Britain. Varadkar did not mention the government's Brexit strategy in his speech, but has previously warned against taking too tough a line with London in negotiations due to begin next week. "It has always been the view of the party that we don't want to see Britain being punished" for voting to leave the European Union, he said on June 2. "We regret that decision but we do respect it and a 'hard Brexit', whether it's a hard Brexit driven from London or forced on London, is one in which Ireland could be a big loser," he said. Varadkar confirmed he would meet this week with Sinn Fein leader Gerry Adams and Arlene Foster, leader of the Democratic Unionist Party (DUP) in Northern Ireland to discuss Brexit. Although regarded as relatively liberal on social issues such as gender equality and abortion rights, Varadkar has been criticised by opposition parties for his right-wing economic views. Adams said earlier that his party would vote against him noting that "not all young people are progressive" and expressing fears the new taoiseach would "drag this government even further to the right". The abstention of the biggest opposition party, Fianna Fail, allowed Varadkar to gather the necessary votes required to lead a fragile minority government. In a move designed to heal any divisions in his own party, Varadkar on Tuesday appointed the man he defeated, Simon Coveney, as deputy leader of Fine Gael. As part of a cabinet reshuffle expected Wednesday evening, Coveney is widely expected to be appointed minister for foreign affairs, with a key role in communicating Ireland's position on Brexit.